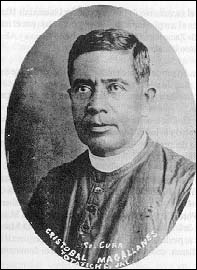 Saint Cristóbal Magallanes Jara, also known as Christopher Magallanes (July 30, 1869 – May 25, 1927), is a martyr and saint venerated in the Catholic Church who was killed without trial on the way to say Mass during the Cristero War after the trumped-up charge of inciting rebellion. The Baptism of Cristobal Magallanes Jara; he was baptized on August 7th, 1869. He was born in Totatiche, Jalisco, Mexico on July 30, 1869. He was son of Rafael Magallanes Romero and Clara Jara Sanchez, who were farmers. He worked as a shepherd in his youth and enrolled in the Conciliar Seminary of San José in Guadalajara at the age of 19. Magallanes wrote and preached against armed rebellion, but was falsely accused of promoting the Cristero Rebellion in the area. Arrested on May 21, 1927, while en route to celebrate Mass at a farm, he gave away his few remaining possessions to his executioners, gave them absolution, and without a trial, he was killed four days later with Saint Agustín Caloca in Colotlán, Jalisco. His last words to his executioners were "I die innocent, and ask God that my blood may serve to unite my Mexican brethren." He was succeeded as parish priest of Totatiche by Fr. José Pilar Quezada Valdés, who went on to become the first bishop of the Archdiocese of Acapulco. A statue of Cristóbal Magallanes Jara on the exterior of Catedral de la Asunción de María Santísima in Guadalajara. Fr. Magallanes was canonized by Pope John Paul II on May 21, 2000. He is celebrated in the Catholic Church with an optional memorial on 21 May. The concluding sequence of the movie For Greater Glory (2012) says that the fictional character "Father Christopher" portrayed by actor Peter O'Toole was based on St. Cristobal Magallanes Jara. This page was last edited on 22 January 2019, at 22:21 (UTC).